Luxembourg Forum Features Prominent Judges from the United States and European Union | News | School of Public Affairs | American University in Washington, D.C.
SPA Dean Barbara Romzek joins U.S. Associate Supreme Court Justice Stephen Breyer and WCL Senior Associate Dean Lia Epperson on stage during the Luxembourg Forum. American University’s School of Public Affairs and Washington College of Law cohosted the Academic Conference of the 2017 Luxembourg Forum on April 21. The Luxembourg Forum is a legal exchange between the U.S. Supreme Court and the Court of Justice of the European Union. The goal is to facilitate dialogue and enhance mutual understanding between the U.S. and EU judicial systems. SPA Dean Barbara Romzek introduced the “Keynote Conversation” in the afternoon about judges as diplomats in advancing the rule of law. 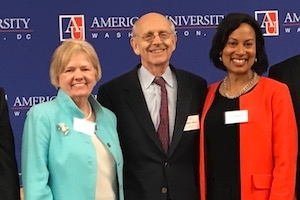 The featured speakers during this session included Stephen Breyer, Associate Justice, U.S. Supreme Court, and Koen Lenaerts, President, Court of Justice of the European Union. The program was moderated by SPA Professor Bill Davies and WCL Professor Fernanda G. Nicola.